Introduction: The medical task of surgery is one of the most complicated and intricate tasks performed by human beings. The high pay grade that surgeons have is due to the intense requirement of medical knowledge and high level of dexterity medical professionals need for surgery as the level of risk in surgery is incredibly high. The initial process of surgery worked using cadavers and fake human bodies which were mimicked and made to scale for the purpose of education and practice for surgeons but the increasing number of medical students coupled with the increasing demand for specialty surgeons capable of handling delicate tasks, especially in third world countries where there is not enough resources or financial capital available for first world healthcare, needs to be addressed to provide a healthcare solution that is feasible and is financially sound allowing for maximum accessibility and affordability for the healthcare markets. Research from Healthcare Market Reports Consulting indicates the solution to be Augmented Reality. Augmented Reality: Augmented reality is a recent technology breakthrough introduced as a complimentary partner to virtual reality. The technology began primitively with the introduction of sprite imposition by pinning virtual objects on the environment that a user rendered through their camera. The movement and environment, both worked in real time, allowing the user of the AR to experience a semi simulated reality experience which was put into their real world environment. The major use of the technology so far has been in Gaming, Precision Engineering, Skill training and technical proficiency based fields like engineering and virtual design. 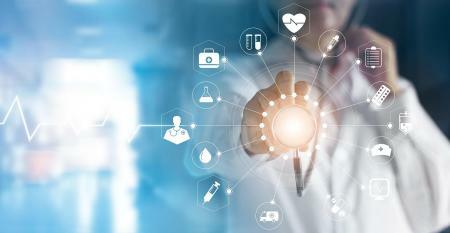 The platform has grown to incorporate higher functionality, accuracy and a better environment for precision and real life imaging and graphics allowing it to enter into multiple new fields of which healthcare is one of the main ones. AR in Healthcare: Augmented Reality has a variety of applications in healthcare. The technology has been evolving over the past few years and increased investment into research and development has led to more advanced instruments being used to implement the technology. The primary application of Augmented Reality is in the field of training for medical professionals. The technology is used to give them information of diseases, understanding complex structures and components of the human body, simulating a virtual environment of difficult situations which they may need to handle, and in analyzing patient health and conditions. The application of AR has already begun in hospitals aiming to apply the technology to decrease the risk involved with a procedure and increase the accessibility to information that doctors would have. In March 2018, Texas surgeons were the first ones to use augmented reality to perform a minimally invasive surgery procedure. The surgeons used the tech to plan a path for the surgery, display the structures needed to be operated on for better view and present an overall endoscopic view of the body. The success of the procedure led to increased confidence in the adoption of the technology and has put an emphasis in the potential that Augmented Reality has to redefine the field of medicine. Market Scenario: North America is expected to dominate the global augmented reality in healthcare market size, owing to rising awareness and growing demand for augmented reality in this region. Moreover, technological advancements in augmented reality are also accentuating market growth in North America. Europe is the next most-dominant market for augmented reality in healthcare market. On an average, Europe spends over 8% of its GDP on healthcare. Opportunity: While Augmented Reality is a technology that is still evolving and requires a significant amount of effort and investment for it to be implemented on a large scale, highly advanced facilities have already begun adopting the use of AR for basic procedures and the expectation is that the rate of adoption will increase. The technology has a potential of providing doctors with information in real time, showing a visual model of their procedure when combined with optical sensors and on a large scale, integrated with communications technology, Augmented Reality can allow accessibility for third world economies to medical professionals globally and can further be used to provide first world medical services to emerging economies.This would result in a major decrease in the high mortality rate of countries like those in the African and Asian Sub continent. The availability of medicinal technology and medical expertise on a large scale globally can be facilitated through the use of Augmented Reality based technology.